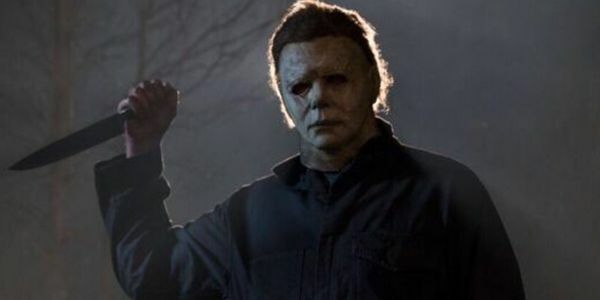 We shared the non-spoiler portion of my conversation with Halloween director David Gordon Green last week but now that the movie is in theaters, it’s time to talk spoilers – especially with an additional installment from this team seeming very likely. We only managed to scratch the surface of my list of burning questions after seeing the film, but Green did offer up a behind the scenes look at why Allyson’s boyfriend (or rather, ex-boyfriend) Cameron (Dylan Arnold) survived the film, how the movie ended up with a moment when Michael Myers encounters a baby, which character was the toughest for Green to kill off, and more. Did you make the decision not to kill the boyfriend for a reason? DAVID GORDON GREEN: Yeah. There’s some ideas for him for later. GREEN: But do you see the allusion to him and who he his? We refer to his father being Lonnie who was the young kid from the original film. There’s ideas for him. There was more stuff of him and we decided to hold back and see what we could use later. The other thing I was wondering about is the very end of the movie and if that stayed consistent throughout. Was Michael always meant to perish in a fire in that trap? GREEN: I sure hope not. That’s my follow-up! 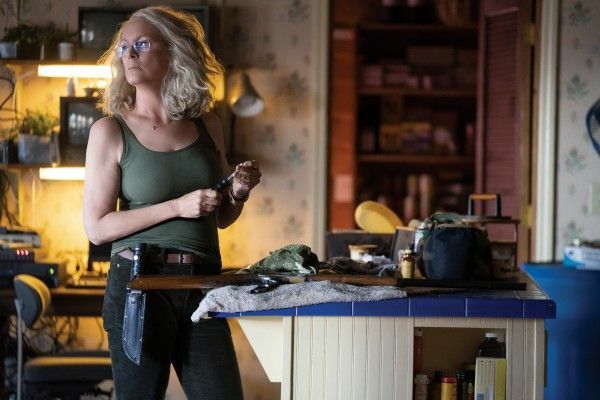 Did you ever have a scene in mind where Laurie, given everything she’s been through, would want to go back and search through the ashes? GREEN: That sounds like a good sequel idea. You never know. Given the position you’re in right now, where you’re essentially retconning so many sequels, are there any nerves or apprehension? You’ve got this fantastic film; are there any sequel pitfalls that you are actively trying to avoid? GREEN: I think any sequel is going to be burdened with pitfalls. You want to be audacious. You want to be bold. If an audience turns up for this movie when it comes out, which I really hope they do, do you give them what they’re expecting or do you challenge them and give them something totally radical? That’s what I’m always thinking of, like, how do I meet my own personal desires to do something innovative and kind of fucked up and fun and energize myself with the narratives and the stories I’m telling versus appeal to something that an audience has proven to like or dislike? Do I respond accordingly or do I just surprise everybody? That’s a fun way to think about it; what if you retconned it again? What if you did something totally radical? What if it was all – you did a sequel that was one shot like Russian Ark, or something totally bizarre? Or do you fall into your own – do you bring back the successful characters that survived and give everybody the one ups? I always look at Revenge Of The Nerds II as like, they took what was funny about the first one and did an even longer belch contest, you know? Those are the traps. When you do it again but you do it louder, it’s boring. You know what I’m saying? Anybody that can step into the world of sequels, the world of reinvention, the reboot and have something new to say or an interesting approach or a concept that matters and is artistically productive, that’s interesting. Before we have to wrap this up, who was the toughest character for you to kill off? Especially with what you said earlier, I think the person that was most difficult for me to see die on screen was Toby Huss. GREEN: He’s my favorite. And he was really mad that I killed him. He’s playing Emily Dickinson’s father in this new series that I start on Monday, so I have to keep working with him anyway and keep him alive in my heart. Were any of the more elaborate kill sequences especially difficult for you to shoot? There’s a lot of standouts here. GREEN: The difficult one is that one long shot because we had two kills. Each of those kills was very difficult to achieve, and we had a limited period of time to do it. Did 11 takes of that door-to-door shot. Take one, have a stunt woman in the first one, and she goes over the table and blah, blah, blah, you see her hit the deck face down, and the lady at the end of it closes the blinds and then you don’t see the kill. We did all these variations trying to find it. In that sequence, why doesn’t he kill the baby? GREEN: Why doesn’t he? Because that would be so rude. GREEN: I think it was a consideration. By the way, that’s Jamie Lee Curtis’ baby sound. She’s making that sound of the baby. Yes, it’s terrifying in its own right. And it was a last minute idea; I mean, why is there a baby crib in the living room? But it was gonna be her husband sleeping on the couch, but then he didn’t show up and we scrambled and put a baby crib in there. And then, yeah, I thought it was interesting to see one ethical choice that he made in the movie, so that’s the one ethical choice he makes. And when he’s in the cop car, the choice to not kill Allison in the backseat but go directly for Sartain in front of him. That was a really interesting conscious choice too that I appreciated. GREEN: Right. If he wasn’t so pissed at him, he probably would’ve gone for her but, you know, he had business to attend to.